Pontoon Boat Enclosures can allow you to get the most out of your pontoon. There are many practical benefits to having an enclosure for your boat. They can provide you with shelter whilst fishing which is particularly useful when fishing in the rain. 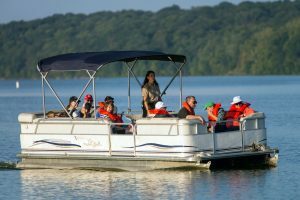 Pontoon boat enclosures are useful all year round. Perfect for keeping you warm during the cold weather. During the summer, an enclosure will help keep the sun beams out of your eyes and shield you from the many bugs and insects flying around. Perhaps you just want some privacy and want to keep out of the eye of other boaters. To help you make the decision of which products to purchase, I’ve compiled a buyer guide with detailed reviews of each recommended pontoon boat enclosure. I’ll also briefly be explaining the benefits of having one to help you decide on purchasing one or not. Towards the end, I’ll explain the maintenance process of a boat enclosure. This will hopefully provide you with the information you need to keep your enclosure in good condition. If you’ve had experience boating in strong winds, then you’d know that it can make for a very unenjoyable trip. Winds also increase the chances of your belongings being swept up and thrown into the water. I’ve lost many hats to the sea in my time! Enclosures do a great job at sheltering you from the wind. There’s nothing worse than boating in the rain. Most of the time we try to avoid being out on the water when it’s raining but sometimes it’s unavoidable. Many times, I’ve been out on the water and it’s just began raining out of nowhere. Having an enclosure installed onto your boat will decrease the impact of the rain on your boating experience. Enclosures provide great shelter from the rain. As I had briefly mentioned in the introduction, enclosures provide great protection from the sun. The beams which the sun provide can be very harming to us, therefore it’s important we protect ourselves from it. If you’re like me and your burn easy, then an enclosure during the warm seasons is necessary. If you’ve got young children on board then it would be irresponsible not to have an enclosure. With the use of a pontoon boat enclosure you can use your boat for camping on the water. Personally, I’ve only done this once or twice however I know people who do this regularly. This can make for an amazing time with the family. It’s very cheap and doesn’t take too much preparation. You don’t necessarily have to be in the middle of the water. You could even be parked up at the dock. The best pontoon boat enclosure on the market is the Gazebo Shade Top by Taylor Made Products. This is a fantastic enclosure which is very widely used. It comes in many different colours to suit your preferences. This enclosure doesn’t cover your whole boat, it is installed over the front bow. This is great as it doesn’t restrict your vision, it allows you to appreciate the lovely view of the water. The only downsides of this enclosure are it doesn’t provide you with ultimate privacy as it doesn’t cover the entire boat. It may also not be the best in extreme winds, so if the weather in your location is particularly bad then it may not be the right suit. Regardless this is still an amazing product which comes complete with frame, shade, hardware, and storage bag. This enclosure has sufficient head room to prevent taller passengers from rubbing their head along the shade. I’d highly recommend this product. This is another great pontoon boat enclosure which can be easily installed by almost anyone. You can have this enclosure installed in just a few minutes with the use of their user-friendly instruction manual. The double-walled aluminium frame makes for a very sturdy enclosure that won’t be broken any time soon. This enclosure is perfect for protecting you and your boat from harsh weather and direct sunlight. Due to the fact this it’s not manufactured for a specific boat, you should be able to install it regardless of which boat you have. Best choice’s Bimini Top is without doubt one of the best pontoon boat enclosures on the market right now. The 600 Denier by Summerset is a truly amazing pontoon canvas top which fits on the bow of your boat. There are a few different colours available for you to choose from so you can decorate your boat and make it as appealing as you’d like. The installation is very quick and easy, you can have it set-up properly in just a few minutes. This canvas top is manufactured from a solution dyed fabric which promises to provide 99.9% UV protection. This will significantly protect your eyes from the sun. The product uses very high quality marine grade materials. This canvas is waterproof, so it will perform well in rainy conditions, keeping you nice and dry so you can enjoy your trip to the fullest. This will allow you to fish from the bow of your boat without getting soaked in the rain. Half enclosures are a Bimini top however they will often have curtains on the side to protect your privacy. There will often be easy to uninstall and store away. They will fit inside the boot of your boat. A benefit of using a half enclosure is that they provide protection from the rain and sun whilst still allowing for access to the bow of your boat. The curtains also provide you with some privacy whilst fishing, in-case you’re on a lake with a bunch of other boaters that you don’t want to watch you. It’s not easy to find a one-size-fits-all half enclosure. For a good one, you’ll most likely have to go for a more expensive product or a custom-made enclosure which has been manufactured specifically for your boat. This makes it important that you ensure that the half enclosure that you’re purchasing will fit your boat. If you need assistance with finding an appropriate enclosure for your boat, you could seek help in a variety of different places. The easiest would be to contact an online manufacturer that could provide you with a quote on a custom enclosure for your boat. You could also contact a local canvas maker if it’s more convenient for you. Another type of enclosure is a half with bow cover. As the name would suggest, it’s very similar to a half enclosure however has a canvas which covers the bow of your boat. This is another great type of enclosure which isn’t as expensive as a full enclosure however still provides protection for the bow of your boat. Bow covers are can be very beneficial to your boat, even if you’re not actively using your boat. They can be installed onto your boat whilst parked at the moor or in storage. This will prevent dirt from falling into your boat. This will allow you to return to a clean boat and eliminate the need of sweeping your boat. I really like these types of enclosures. They’re a great in-between from a full enclosure and a half enclosure. I’d highly recommend this type of enclosure as it is personally one of my favourites. Finally, are the full enclosures. A full enclosure will cover your whole pontoon boat. Within minutes, your pontoon will be turned into a caravan on water. There are many reasons why this is such a great choice. This type of enclosure provides the most protection and privacy. Completely shielding your boat. This enclosure is great for Flamping (Which I had explained previously). Flamping is essentially camping but in a boat on the water. If you haven’t tried this yet, you’re missing out. It’s a great activity, great for small families. Full enclosures will never come in a one-size-fits-all. You’ll have to have one custom-made for your specific boat. As mentioned previously, you should contact either a local canvas craftsman or you can find one online. The main drawback of a full enclosure is that they can be very costly. For the average product, you’d be looking at around $3,000. Though, for one manufactured well with high quality materials, you’ll be looking to pay closer to the $4,000 mark. The price will vary depending on multiple factors such as the materials, brand, and dimensions of your boat. In this section I’ll be explaining how to maintain your pontoon boat enclosure. Maintenance is key in keeping your enclosure clean and in good condition. If your product isn’t maintained properly, it could lead to breakages and rips in the material which would then cause leakage. Essentially, if not maintained, it will not be effective for long. It’s important that we try our best to prevent the growth of mold. This can be done by ensuring that your product is dry before you store it. If you uninstall your enclosure and straight away fold it up and shove it into it’s storage compartment, you’re inviting bacteria. It doesn’t take much effort to prevent this. Simply rub it down with a towel or let it sit to dry before you store it. Despite your efforts, if you notice mold spores growing on your enclosure then you’ll have to treat it with stain remover as soon as possible. I’d recommend this stain remover by Star Brite. A few squirts and a good wipe down should eliminate any spores keep your product clean. It’s important to use marine-grade cleaners on your enclosure. We don’t want to ruin the material with harmful chemicals that will chew away at the plastic. This could lead to breakages, tears and give plastic a clouded effect. There are many different marine grade cleaners which will do the job perfectly. I’d recommend this cleaner by IMAR. This is a very high-quality cleaner which will work effectively on your enclosure. You’ll want to remember to uninstall your enclosure when winterizing your pontoon boat. An enclosure is not a replacement for a boat cover, you shouldn’t leave it on for long periods of time when your boat is not in use. Keep in mind that this only applies for Bimini tops. Half enclosures and full enclosures can be left installed as they protect the boat like a cover would. The best pontoon boat enclosure would be the Easy-Up Gazebo Shade Topby Taylor Made Products. Though, before you buy anything you should always do your research. By this I mean reading the product specifications and it’d be a good idea to read some of the latest reviews. This will allow you to get the most out of your money.